It’s my birthday, it’s my birthday, I’mma spend my money…. And eat ALL the cake. 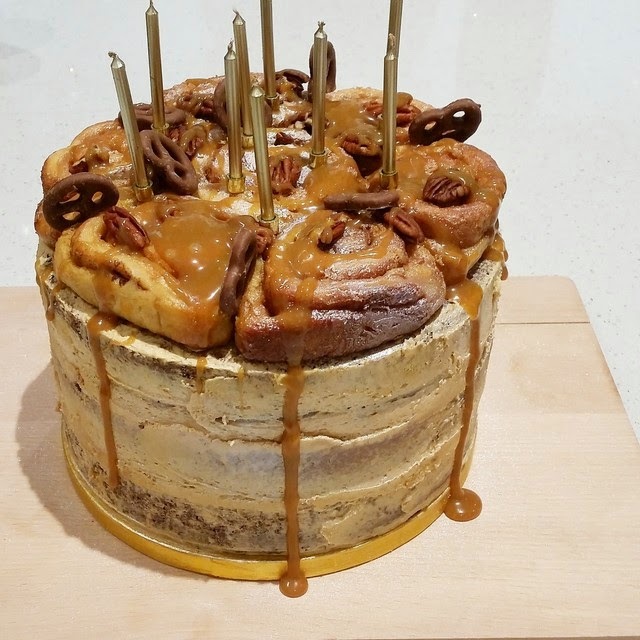 This Salted Caramel Cinnamon Roll Cake was made by the gorgeous Sanj of K.O Rasoi, to surprise me with an early birthday treat at work earlier in the week. It was literally created from all of my favourite things and made the cake of my dreams. 1. It had cinnamon rolls on top. These are most favourite treats ever and perfect for the festive period. 2. Chocolate. Covered. Pretzels. My second favourite thing ever. 3. Caramel dripping seductively down the side, Nigella style. 4. Salted caramel icing. Heaven. 5. Chocolate sponge soaked in rum. 6. It’s covered in glitter! I also received some shiny new jewels, which will be featured at a later date. Thanks Sanj and Dubz for spoiling me. Previous Post Merry Freakin’ Christmas!